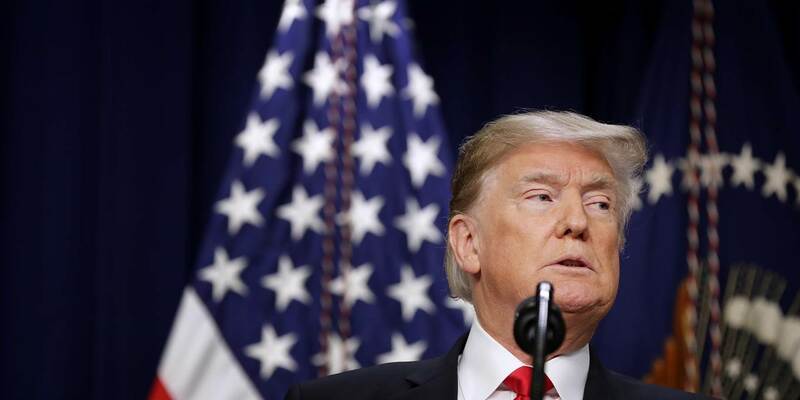 Between publicly chastising US Federal Reserve Chair Jerome Powell and escalating his trade war with China, US President Donald Trump has finally rattled the markets. While investors were happy to look the other way during the first half of Trump's term, the dangerous spectacle unfolding in the White House can no longer be ignored. NEW YORK – Financial markets have finally awoken to the fact that Donald Trump is US president. Given that the world has endured two years of reckless tweets and public statements by the world’s most powerful man, the obvious question is, What took so long? For one thing, until now, investors had bought into the argument that Trump is all bark and no bite. They were willing to give him the benefit of the doubt as long as he pursued tax cuts, deregulation, and other policies beneficial to the corporate sector and shareholders. And many trusted that, at the end of the day, the “adults in the room” would restrain Trump and ensure that the administration’s policies didn’t jump the guardrails of orthodoxy. These assumptions were more or less vindicated during Trump’s first year in office, when economic growth and an expected increase in corporate profits – owing to forthcoming tax cuts and deregulation – resulted in strong stock-market performance. In 2017, US stock indices rose more than 20%. But things changed radically in 2018, and especially in the last few months. Despite corporate earnings growing by over 20% (thanks to the tax cuts), US equity markets moved sideways for most of the year, and have now taken a sharp turn south. At this point, broad indices are in correction territory (meaning a 10% drop from the recent peak), and indices of tech stocks, such as the Nasdaq, are in bear-market territory (a drop of 20% or more). Though financial markets’ higher volatility reflects concerns about China, Italy and other eurozone economies, and key emerging economies, most of the recent turmoil is due to Trump. The year started with the enactment of a reckless tax cut that pushed up long-term interest rates and created a sugar high in an economy already close to full employment. As early as February, growing concerns about inflation rising above the US Federal Reserve’s 2% target led to the year’s first risk-off. Then came Trump’s trade wars with China and other key US trade partners. Market worries about the administration’s protectionist policies have waxed and waned throughout the year, but they are now reaching a new peak. The latest US actions against China seem to augur a broader trade, economic, and geopolitical cold war. An additional worry is that Trump’s other policies will have stagflationary effects (reduced growth alongside higher inflation). After all, Trump is planning to limit inward foreign direct investment, and has already implemented broad restrictions on immigration, which will reduce labor-supply growth at a time when workforce aging and skills mismatches are already a growing problem. Moreover, the administration has yet to propose an infrastructure plan to spur private-sector productivity or hasten the transition to a green economy. And on Twitter and elsewhere, Trump has continued to bash corporations for their hiring, production, investment, and pricing practices, singling out tech firms just when they are already facing a wider backlash and increased competition from their Chinese counterparts. Emerging markets have also been shaken by US policies. Fiscal stimulus and monetary-policy tightening have pushed up short- and long-term interest rates and strengthened the US dollar. As a result, emerging economies have experienced capital flight and rising dollar-denominated debt. Those that rely heavily on exports have suffered the effects of lower commodity prices, and all that trade even indirectly with China have felt the effects of the trade war. Even Trump’s oil policies have created volatility. After the resumption of US sanctions against Iran pushed up oil prices, the administration’s efforts to carve out exemptions and bully Saudi Arabia into increasing its own production led to a sharp price drop. Though US consumers benefit from lower oil prices, US energy firms’ stock prices do not. Besides, excessive oil-price volatility is bad for producers and consumers alike, because it hinders sensible investment and consumption decisions. Making matters worse, it is now clear that the benefits of last year’s tax cuts have accrued almost entirely to the corporate sector, rather than to households in the form of higher real (inflation-adjusted) wages. That means household consumption could soon slow down, further undercutting the economy. More than anything else, though, the sharp fall in US and global equities during the last quarter is a response to Trump’s own utterances and actions. Even worse than the heightened risk of a full-scale trade war with China (despite the recent “truce” agreed with Chinese President Xi Jinping) are Trump’s public attacks on the Fed, which began as early as the spring of 2018, when the US economy was growing at more than 4%. Given these earlier attacks, markets were spooked this month when the Fed correctly decided to hike interest rates while also signaling a more gradual pace of rate increases in 2019. Most likely, the Fed’s relative hawkishness is a reaction to Trump’s threats against it. In the face of hostile presidential tweets, Fed Chair Jerome Powell needed to signal that the central bank remains politically independent. But then came Trump’s decision to shut down large segments of the federal government over Congress’s refusal to fund his useless Mexican border wall. That sent markets into a near-panic, and the government shutdown was soon followed by reports that Trump wants to fire Powell – a move that could turn a correction into a crash. Just before the Christmas holiday, US Treasury secretary Steven Mnuchin was forced to issue a public statement to placate the markets. He announced that Trump was not planning to fire Powell after all, and that US banks’ finances are sound, effectively highlighting the question of whether they really are. Recent changes within the administration that do not necessarily affect economic policymaking are also rattling the markets. The impending departure of White House Chief of Staff John Kelly and Secretary of Defense James Mattis will leave the room devoid of adults. The coterie of economic nationalists and foreign-policy hawks who remain will cater to Trump’s every whim. As matters stand, the risk of a full-scale geopolitical conflagration with China cannot be ruled out. A new cold war would effectively lead to de-globalization, disrupting supply chains everywhere, but particularly in the tech sector, as the recent ZTE and Huawei cases signal. At the same time, Trump seems to be hell-bent on undermining the cohesion of the European Union and NATO at a time when Europe is economically and politically fragile. And Special Counsel Robert Mueller’s investigation into Trump’s 2016 election campaign’s ties to Russia hangs like a Sword of Damocles over his presidency. Trump is now the Dr. Strangelove of financial markets. Like the paranoid madman in Stanley Kubrick’s classic film, he is flirting with mutually assured economic destruction. Now that markets see the danger, the risk of a financial crisis and global recession has grown. Nouriel Roubini, a professor at NYU’s Stern School of Business and CEO of Roubini Macro Associates, was Senior Economist for International Affairs in the White House's Council of Economic Advisers during the Clinton Administration. He has worked for the International Monetary Fund, the US Federal Reserve, and the World Bank. The past couple of years have been brutal for precious metals mining stocks. Gold and silver went down a little while the miners went down a lot – four times as much to be exact. That’s painful but not surprising. The miners, being in effect options on the underlying metals, tend to be a lot more volatile. 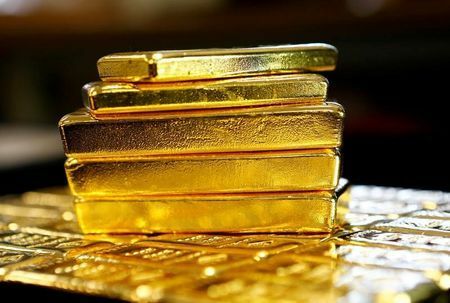 But volatility works both ways, and starting in November gold began to rise while the miners began to rise more. With January normally being a great month for precious metals, it’s possible that the miners will be among the best performing sectors for a while. It’s also possible that the outperformance will have legs, as recent financial asset volatility sends capital pouring into safe haven assets. 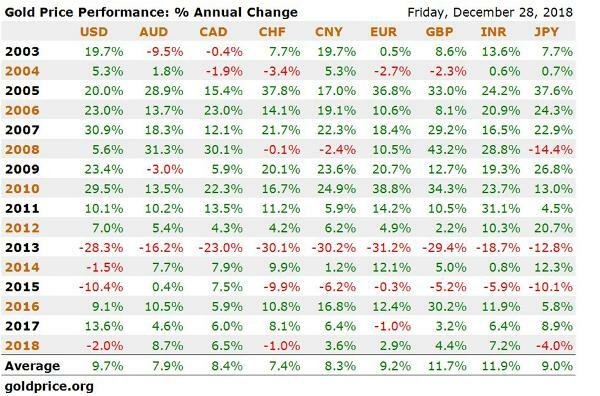 On a related note, gold’s performance hasn’t been nearly as bad as it’s seemed. Even in US dollar terms, it’s up over the past three years and has returned an average of over 9% a year since 2003. About a year ago, a Boeing BA -0.24%▲ 747 operated by Delta Air Linestook off from Atlanta for a three-hour flight to Pinal Airpark, a boneyard for unwanted aircraft in Arizona’s Sonoran Desert. The once celebrated giant of the sky, which had transformed international travel with its size and range, had flown its last flight for a U.S. airline. Delta has replaced its fleet of jumbo jets with Airbus A350s, one of a new breed of smaller, ultraefficient long-range airliners. Nearly every other airline in the world is doing a version of the same thing, replacing huge jets with smaller ones. The newer planes, which include the Boeing 787 Dreamliner, are redrawing the map for global air travel. They can fly just as far as the jumbos, but often are less expensive to operate on a per-seat basis. They allow airlines to offer multiple flights on routes that once justified only a single big aircraft. That helps fill seats and boost profits. For passengers, this is a mixed blessing. As planes get smaller and flights more frequent, long-haul travel is taking on some of the cattle-car characteristics of domestic travel—inexpensive tickets, cramped seats and no free meals. On the other hand, for many international travelers, the shift is eliminating what has been an almost mandatory stopover in a global airport hub such as New York, London, Dubai or Singapore. Amplifying the shift is the proliferation of no-frills budget carriers flying internationally that have helped to drive down ticket prices and spur a boom in air travel. Long-haul flights—once an extravagant commitment of time and money—are becoming less expensive and more convenient. Between 2007 and 2017, the average fare between North America and Europe, adjusted for inflation, declined by 40%. In 2000, airlines flew 1,414 direct international routes of more than seven hours, according to air-travel data provider OAG Aviation Worldwide Ltd. This year, they flew 2,778. Direct service now links Providence, R.I., with Edinburgh, Scotland, Oakland with Barcelona, Las Vegas with Copenhagen, and Los Angeles with Chengdu, China. That is a boon for travelers such as Evan Laskaris, a Greek-American who lives in Chicago. When he was growing up in South Carolina, traveling to Greece involved flying to New York’s LaGuardia Airport, taking a cab to JFK, then flying to Athens. Flying from Chicago was easier, but still took 14 hours, including a three-hour layover in Frankfurt. Airline executives and analysts say the smaller jets have contributed to today’s record profits. Load factor, a measure of seats sold, should reach a record 81.9% this year, according to the International Air Transport Association, in part because smaller planes are easier to fill. The past five years have been the best for collective airline profits, despite the decline in airfares, according to the IATA, an industry trade group. With many passengers focusing on inexpensive fares, however, many long-haul flights no longer offer the kind of international travel experience that was common in yesteryear. Amenities once taken for granted by international economy-class passengers, such as free food or a checked bag with the price of the ticket, have become extras. Seating layouts are determined by airlines, not plane makers. Although premium-class passengers still get plenty of space into the new long-haul flights, economy fliers frequently are packed as tightly as they are on short-haul discount runs. Global hubs aren’t going away. Even some large cities can’t sustain demand for direct flights. Fewer than four passengers a day, on average, travel between Seattle, where Boeing makes most of its planes, and Toulouse, France, where archrival Airbus SE EADSY 0.80%▲ is based, according to data from travel-technology company Sabre Corp.They still have to fly through hubs such as Amsterdam, London or Paris—and probably will for years to come. It has been 80 years since Lufthansapioneered nonstop trans-Atlantic flights with a four-engine Focke-Wulf Fw200 propeller airliner, named the Brandenburg. The trip from Berlin’s Tempelhof Airport to New York’s Floyd Bennett Field took almost 25 hours. International travel opened up to the wider public only much later, thanks again to aircraft innovation. The Boeing 707, the first mass-produced, long-haul jet-powered plane, entered service with Pan Am in 1958, flying between New York and Paris. 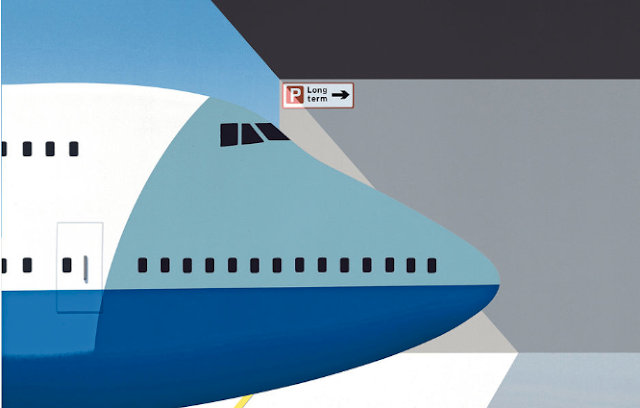 Boeing’s 747, which began flying commercially in 1970, came to define trans-Atlantic flight for a generation. Almost two decades ago, Airbus bet big on its own giant, four-engine aircraft—the A380 superjumbo jet. 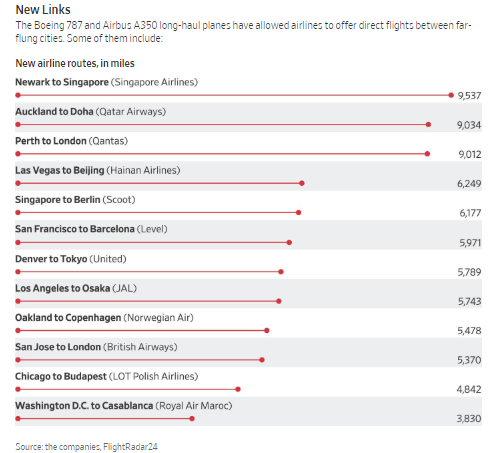 The two plane makers shared the same idea: Airlines, saddled by high operating costs and limited airport slots, would shuttle large numbers of passengers in a limited number of giant planes between a handful of global hubs. Getting to one of these hubs usually involved a connecting flight, as did reaching a final destination from the hub at the other end. For much of the modern aviation era, a plane’s range was mainly dictated by how much fuel it could carry. 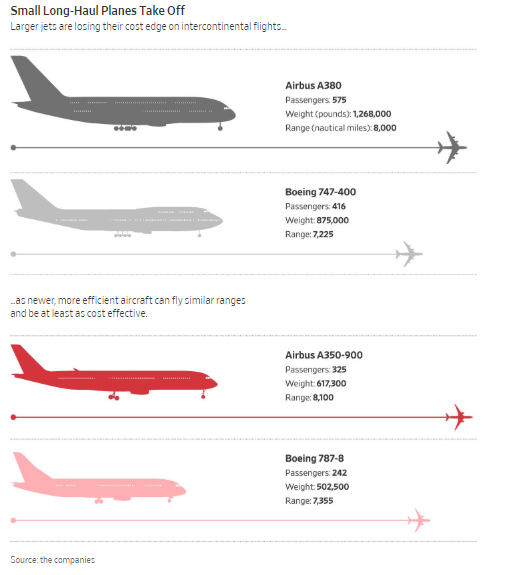 Bigger planes, with bigger gas tanks, could fly longer. Then, suddenly, technology allowed long-haul planes to shrink. In 2003, Boeing started developing what would become its twin-engine 787 Dreamliner. Made partly of composite material, it was light enough to fly as far as a 747. But it was much smaller, carrying an average 242 passengers, compared with the 410 typical for the 747. A Boeing Dreamliner 787, one of a new breed of smaller, ultraefficient long-range airliners, sits in a production line in North Charleston, S.C.
Airbus, which had just bet big on the 575-seat superjumbo, answered with its own version of what the industry has dubbed a “hub buster”—the A350, which typically seats 325. “The 787 and A350 were, and are, disrupters,” says Nico Buchholz, a former fleet planner at Deutsche Lufthansa AG. The Dreamliner embraced a host of new technologies, notably its weight-saving carbon-fiber fuselage. Composites account for half of the weight of the Dreamliner’s hull. The plane’s electric system replaces some of the heavy hydraulics and pneumatic components typical in big jets. All that, plus more efficient engines, allow the plane to undercut the larger planes in an important metric: per-seat flight cost. Bigger planes once won that contest because fixed costs such as pilots, crew and fuel were spread out over more seats. But the new breed of lighter planes upended that. United Continental Holdings Inc.’sUnited Airlines spent about $17,748 an hour to operate its latest 747 in the 2017 fiscal year, according to consulting firm Oliver Wyman. It spent $10,123 for one of the airline’s smaller 787 Dreamliners. That translates to a per-passenger cost of 9.19 cents a mile for the Dreamliner, compared with 9.23 cents a mile for the bigger plane. The smaller planes also are easier to fill up, reducing the need to offer discounted tickets. So airlines began buying the smaller planes and mothballing their bigger ones. Last year, Singapore Airlines Ltd.consigned one of its first A380s to the scrapyard. It was only 10 years old. Nobody else was found who wanted to fly it. “The role of the big planes has diminished,” says Campbell Wilson, senior vice president for sales and marketing at the Singapore carrier. The company’s Scoot budget carrier operates Boeing’s Dreamliner for long-haul service linking Singapore with cities such as Berlin and Athens. In October, Singapore Air began flying the world’s longest route, between Singapore and Newark, N.J., with the Airbus A350. Boeing, which has sold more than 1,400 Dreamliners, plans to deliver around 140 this year. 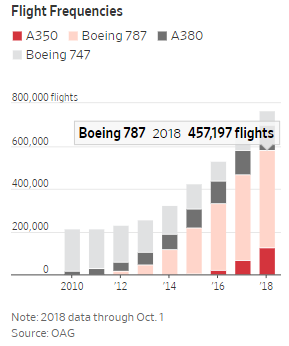 It will make just six 747s this year, down from an average 30 a year since 1969. Almost all of the new 747s are headed for freight service. Airbus has sold 890 A350s since 2006, compared with 331 A380 superjumbos, which it has been selling since 2000. 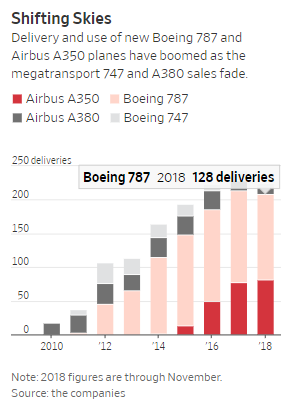 Airbus had hoped to churn out as many as 48 of the superjumbos every year, but this year is set to deliver about 12, and next year, just six. It will produce more than 80 A350s this year. Australian airlines, by geographical necessity, specialize in long-haul travel. Qantas Airways Ltd., one of the country’s biggest, has been a steady buyer of the giant 747s and A380s over the years. Today, Alan Joyce, Qantas’s chief executive, says the airline can fly two Boeing Dreamliners to an overseas destination more profitably than one A380, transporting about the same number of passengers. The push for more direct routes doesn’t only stem from technological innovation. Governments have opened up air access to ease congestion at big hubs and foster more convenient flights. Flights to China used to focus on Beijing, Shanghai or Guangzhou. Now cities such as Wuhan, Xi’an, and Hangzhou have direct international air links. When Japan’s primary hub, Tokyo Narita, filled up, Japan’s government expanded the largely domestic airport of Haneda and opened it to overseas flights. Some airlines still focus on big jets. Dubai, the home airport of Emirates Airline, is a perfect stopping-off place for travelers between Asia and Western Europe and North America. Emirates is the world’s biggest buyer of the A380, Airbus’s superjumbo. Emirates President Tim Clark says that without big planes, the growth of air traffic will be constrained by airports that are reaching their limits for takeoff and landings slots. Dubai is building a huge, five-runway airport designed to eventually handle 250 million passengers a year. “In the end, you are forced into a higher gauge of aircraft,” he says. That isn’t the way other airlines are thinking. At an airfield near Tarbes in southern France, about 70 miles from where the A380 superjumbo made its maiden voyage 13 years ago, one of those planes is parked on the tarmac. Singapore Airlines decided to stop using the plane, which is owned by Dr. Peters Group, a private company that finances aircraft. After looking for a new customer, the owner has decided to sell the plane for parts. IT IS A sobering thought that official military communication between America and China is still conducted by fax machine. The use of this obsolete technology symbolises a worrying lack of effective dialogue between the two countries’ armed forces. The giants jostle for space in the western Pacific; their ships and jets manoeuvre close to each other every day. Neither side wants war, but China is intent on keeping America at bay. It is easy to imagine how a collision in the air or at sea could escalate. Casualties could fan nationalist flames on either side and cause twitchy officers, or political leaders, to respond in ways that lead rapidly to disaster. So could a misunderstanding by either side of the other’s military movements. Relations between China and America are already strained over trade and a host of other matters. So it is only common sense to try to reduce the risk that their cold-war style sparring might turn hot. American and Chinese officers are getting to know each other better. Exchanges between their military academies, port calls and high-level visits to each other’s countries have multiplied over the years. But there is still a huge gulf. Much of the interaction is superficial. American officers often describe the Chinese who talk to them as “barbarian handlers”: polished, English-speaking political appointees, usually intelligence officers, whose uniforms have never been crumpled or muddied. The Americans are sometimes led around empty Potemkin bases and entertained with kung fu shows rather than genuine drills. They wonder why they should waste their time on such junkets, which offer little insight into Chinese intentions or how the two sides might defuse a crisis. 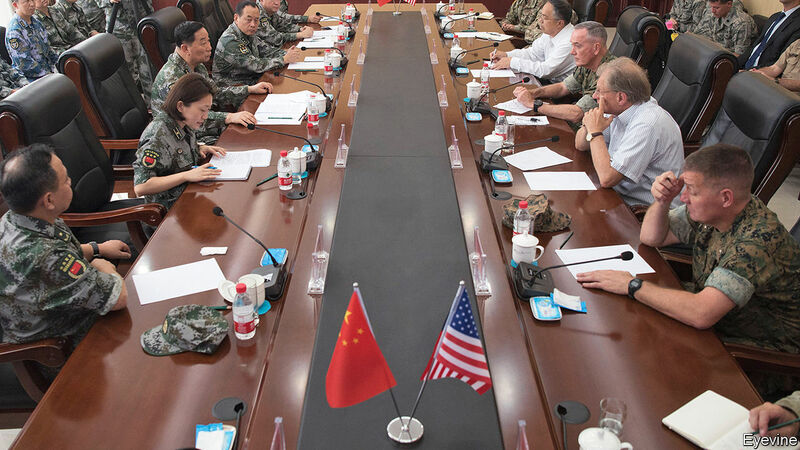 When senior officers of the two sides meet, the Chinese tend to spend much of the time lambasting American foreign policy rather than discussing how to build trust. In recent years China has forged ever-closer military ties with Russia. In September China sent thousands of troops to join Russia’s largest manoeuvres since the cold war. But when invited to take part in American exercises, China has behaved boorishly. In 2014 America, to its credit, allowed the Chinese navy to join RIMPAC, the world’s largest multinational war games at sea. Instead of responding with camaraderie, China demanded plum roles, sent spy ships to snoop on the manoeuvres and barred Japanese officers from the traditional shipboard cocktail party. America excluded China from RIMPAC this year in protest against China’s deployment of missiles on artificial islands it has built in the South China Sea. That upset the Chinese navy, but the Americans rightly felt no loss. Even when given an opportunity to build bridges, Chinese officers have chosen to ignore it. The two armed forces do not just use faxes to communicate. A channel called the Defence Telephone Link was set up a decade ago. A whizzier video link between the chairman of America’s joint chiefs of staff and his Chinese counterpart was established more recently. The problem is not a lack of channels. It is how they are used. American officials have made clear that if China were to call during a crisis, they would pick up the phone. They are not sure whether China would do the same. Part of the problem is the way that China’s armed forces work. The Communist Party is present throughout the military hierarchy. Its political commissars often wield as much power as commanders who are genuine soldiers. Especially at higher levels, Chinese officers can move only at the speed of a committee. But that is no excuse for China’s habit of unplugging the phone. Swift communication may not end a crisis, but it can certainly reduce the danger of tensions flaring up over a misunderstanding. Mercifully, when Barack Obama was president, the two countries managed to establish some rules for managing close encounters between their ships and planes. That has led to fewer near collisions in the air and at sea. But that still falls short. China’s relentless beefing up of its military forces has created an urgent need for wider-ranging agreements. Pentagon officials say China is arming its air force with nuclear weapons. That would give China a complete “triad” of nuclear weaponry, launchable from the air, land and sea. Yet the two armed forces have not held nuclear talks in over ten years. Even the Soviet Union agreed to give warnings about ballistic-missile tests. The Chinese refuse to consider such a confidence-building measure, despite the growing importance of missiles to both countries. On a visit to Washington, DC, in November China’s defence minister, Wei Fenghe, said that communication must be strengthened. It is good that China recognises this. But all too often the country lets pique over unconnected business disrupt military contacts. In 2018 it cancelled multiple high-level talks, including an embryonic dialogue between senior military officers. Not since the cold war has it been so crucial for global peace for two defence establishments to talk.